Fedrigoni is an Italian paper manufacturer with over a century of history. To celebrate an exhibition in their London showroom in 2010, graphic artist Laura Quatrill made several models of classic Italian design. These included the Sapper Alessi kettle, the Olivetti typewriter and of course the Piaggio Vespa. The models were made out of Fedrigoni papers and were mailed to customers flat and unconstructed to invite customers to the exhibit. Thanks to Daniel S. for this find. To read more about the models and their design click here . Whoa . . . hold on there. Before you get too excited I must let you know that the instructions are in Japanese and I haven’t been able to find templates to print out that are bigger than postage stamps. 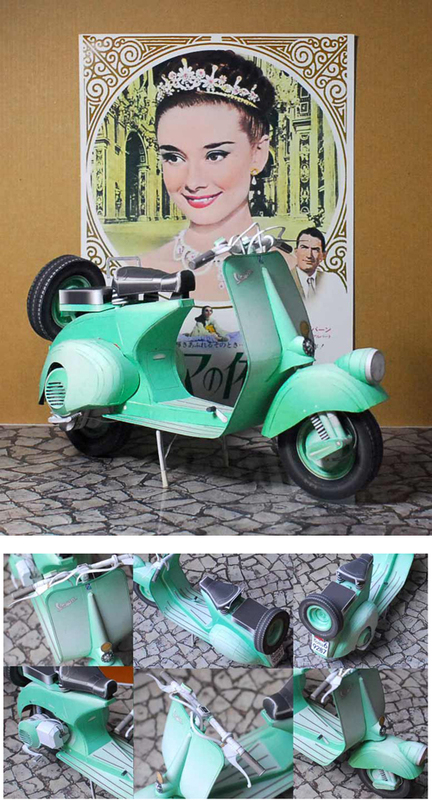 Now that I’ve got the bad news out of the way I can tell you that this is a model of the scooter Audrey Hepburn rode in “Roman Holiday.” And this is possibly the most detailed paper scooter model I’ve ever come across. The 150 cc engine is even represented – just lift up the right cowl! In the meantime I’ll be keeping an eye out for higher res templates and instructions in English for you papier fiends. “Disco Pizza” Delivery Paper Model! Not sure who sent me this awesome paper model (please step forward!) but here you go. It’s from a Japanese site. For other paper models we’ve featured at ScooterSwag, click here. Want to impress your valentine? Make one of these at the dinner table. I know I would be more than a little aroused. I am about to go in and tackle some asparagus but before I do, I thought I’d post this neat little craft for you in case you have some time on your hands. Besides, unlike some of the other paper models I’ve posted, this one is dead easy! I think you could almost turn it into a greeting card. For the full-sized version to print out, please visit this link. Thanks to Dave ThCap’n for this find! Your New Battle Cry: Score and Fold! If you ever wondered if any of the paper models we’ve posted about are worth your time, above is your answer. 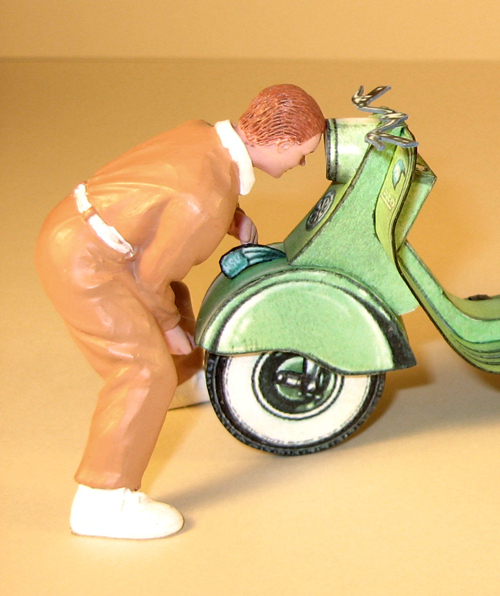 “While I am not a true scooterphile, (my only scooter experience involves some youthful naughtiness in and on a Vespa sidecar,) I do appreciate a vintage paper model. I found the mid-century German kartonmodelle of the NSU / Lambretta LD125 Mk. 1 on your site, and I thought I’d give it a build. I noticed you didn’t have a photograph of the completed model, so I’m sending a few along for your use. 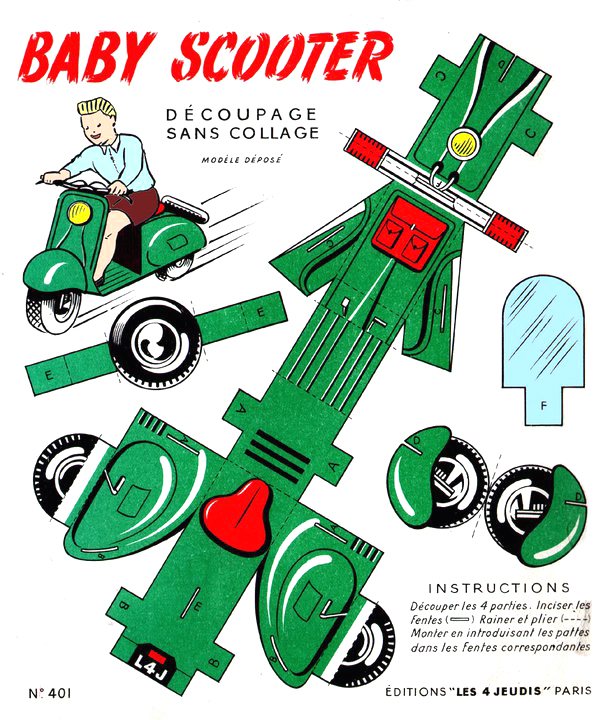 Maybe after seeing a built-up model, more of your scooterheads might give it try. It’s a tricky build, but with the advent of the web, you can always print more parts. 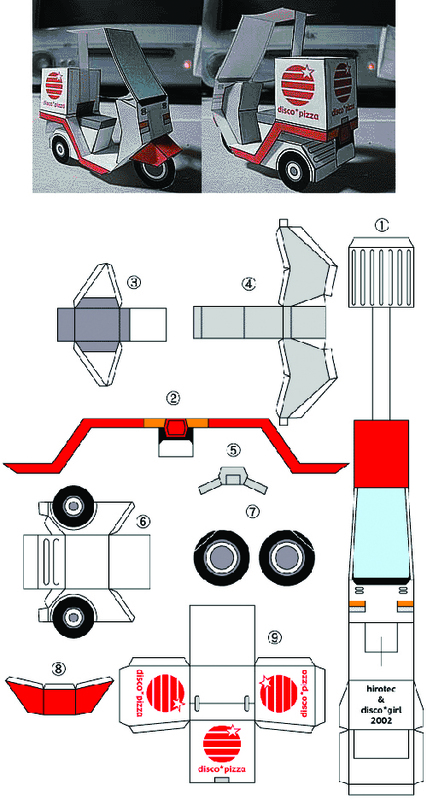 An unbuilt scooter model is like an unsung song. “Glad you like the photos. The resin figures are 1/24 scale by the German firm of Schuco. They may be out of production. If the NSU / Lambretta model is enlarged to fill an 8 1/2 X 11 sheet of card stock, the completed model seems to scale out about 1/24 as well, so I thought the figures and the model would fit together. Thank goodness the photos were taken before the accident! You can also type “Paper Model” into our Search Engine on the right hand side of the page (scroll down a bit) to see all of the posts on this subject. And cheers to Eric for sharing!